Plasma cell. Coloured transmission electron micrograph (TEM) of an active human plasma cell - a type of white blood cell that makes antibodies that attack infectious micro-organisms. The antibodies are manufactured on the surface of a membrane called rough endoplasmic reticulum. This is the finely folded network seen in the yellow area. The rough texture comes from minute protein- making bodies called ribosomes, which cover the endoplasmic reticulum. 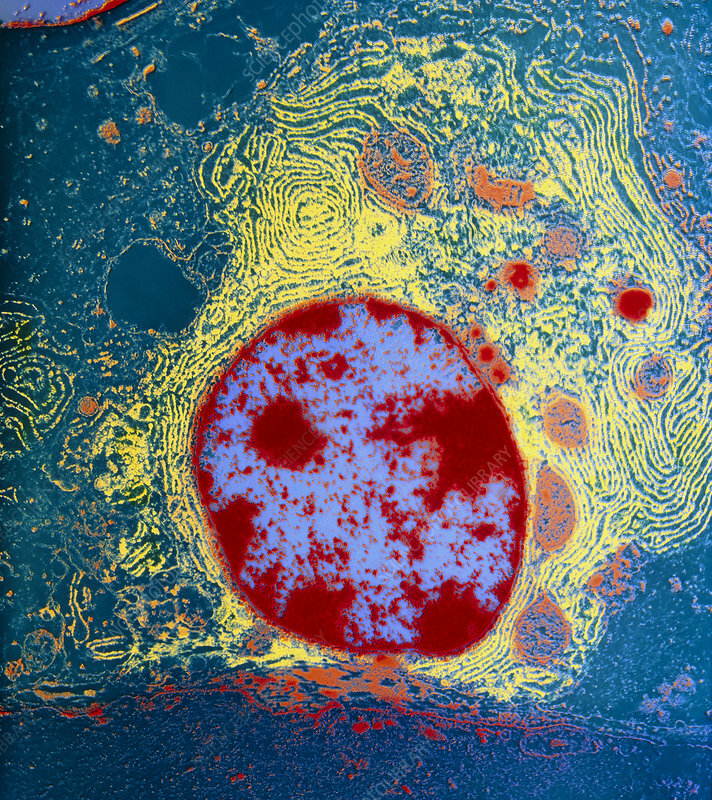 In the centre is the cell's nucleus (blue & red). In plasma cells the nuclear material is often arranged in characteristic, sometimes triangular, blocks, as in this case. Magnification x3333 at 6x4.5cm.